Angry over the response of Yoga guru Baba Ramdev in connection with the Batla House encounter in 2008, Kamran Siddiqui, a resident of Zakir Nagar near Jamia Millia Islamia, said to be running an NGO, Real Cause, threw black ink on Baba’s face at a press conference at Constitution Club today. Amid an open confrontation between the all-powerful Pakistan Army and the civilian government, India has chosen to remain quiet on the developments in the neighbouring country. The Supreme Court yesterday asked the Centre to provide funds to the states and Union Territories for construction of toilets in schools, particularly for girl students. The Supreme Court has ruled that employers can offer incentives to the staff for acquiring additional qualifications and this is not in violation of Article 14 of the Constitution that guarantees equal pay for equal work. After four years, BSP supremo and Uttar Pradesh CM Mayawati’s 56th birthday tomorrow would be a relatively low-key affair due to the model code of conduct being in force in the poll-bound state. Elephants — uncovered and covered — have value in poll-bound Uttar Pradesh. The elephants (the BSP election symbol) were draped fearing that these might give CM Mayawati’s party an advantage in the Assembly elections. Now that these are covered, animal rights body People for the Ethical Treatment of Animals (PETA) wants to use these to highlight cruelty against jumbos in circuses. Press Council chairman and former Supreme Court judge Markandey Katju today said India could not afford to enact its own law on refugees or sign the UN Convention on the subject as 70% of its own population was living like refugees, plagued by unemployment and starvation. Fragments of a US military aircraft, used during World War II, have been recovered in northern Tripura 66 years after it crashed, defence sources said here on Saturday. Two days after the Supreme Court upheld his conviction in the 2006 hit-and-run case and cancelled his bail, Alistair Pereira is yet to surrender. At least 12 persons were killed when a stampede broke out in Hussain Tekri near Jaora town in the district on the occasion of Chellum, a Muslim religious observation that comes after Moharram. UPA allies Congress and Trinamool Congress will cross swords in the Manipur Assembly polls on January 28 with both parties putting up 60 and 47 candidates respectively. No outgoing government in the five poll-bound states —Punjab, Uttar Pradesh, Uttarakhand, Manipur and Goa — is leaving a robust economy for its successor. ‘Yarwng’ is the name of a 95-minute feature film made in Kokborok, the most popular tribal language in Tripura. ‘Yarwng’ means ‘Roots’ in English. The flow of traffic on the Kiratpur-Ner Chowk section in Himachal Pradesh will become smoother in the next few years with the government approving its four-laning along with two more projects for Haryana and Andhra Pradesh entailing a total investment of Rs 5,388.36 crore. Next month's elections to the Brihanmumbai Municipal Corporation will see a battle between the incumbent Shiv Sena-BJP combine and the Congress, which is pushing for a regime change after nearly two decades. The Centre has finally settled the two-month-long dispute between Bihar and Uttar Pradesh over the release of water in the Western Gandak Canal. The advisory committee of Union Ministry of Water Resources (MOWR) in its meeting held in New Delhi on Thursday gave a written directive to the Bihar Government to release water in the canal without any delay. Six police officers nabbed red-handed by state vigilance investigation bureau sleuths for accepting bribes at different police stations some years ago were on Friday jailed and suspended. Three members of a family, one of them a teenaged girl, were killed and two injured when robbers attacked a farmhouse in Bilara, near here, police said today. Barely a month after AIADMK supremo J Jayalalithaa fancied a national role for her party in Lok Sabha polls due in 2014, BJP leader LK Advani today described her as a "natural ally," fuelling speculation that both parties could come together ahead of the polls. Siddiqui had sought Ramdev’s opinion on 2008 Batla House encounter in which two alleged Indian Mujahideen activists were killed. They were suspected of involvement in the Delhi serial bomb blasts. The Yoga guru said the encounter was not fake. Ramdev held a press conference against corruption and he plans to campaign against black money in the coming Assembly elections. When the incident occurred, Baba was seated along with the Janata Party leader Subramanian Swamy. His left eye was blackened by the ink thrown by Siddiqui, a petitioner in the Batla House encounter case. 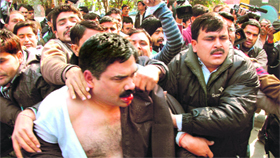 Just as the incident occurred, supporters of Ramdev got hold of Siddiqui and roughed him up before police took him away. The man, whose shirt was torn and removed, was seen bleeding in the lips. There was a lot of jostling when police escorted the Yoga guru away from the club. The venue of the press conference was booked for four hours (12 noon to 3 pm), but the event concluded a few minutes after the ink-throwing incident. Baba later said he was not deterred by such attacks and would continue his campaign against corruption with full force. “We talked about black money, we talked about eradicating corruption and in return, as a prize, this is what I have got. However, by throwing ink at someone, one cannot malign his character,” he said. “One whose life has been devoted to fighting corruption cannot be deterred by black flags and ink,” he said. The attacker, who is a law graduate and gives legal advice to people, was detained by the police and was later arrested. A case under Section 153 of the IPC for provocation and under Section 355 of the IPC for assault or criminal force with intention to dishonour a person has been registered. In the Batla House shootout in Delhi on September 19, 2008, two alleged Indian Mujahideen members and one police officer were killed in public view. Certain local groups and some political parties have alleged it was a staged shootout. However, it is quite obvious to New Delhi that the growing uncertainty in Pakistan could also affect the bilateral dialogue process that was revived less than a year back after painstaking efforts by Prime Minister Manmohan Singh and his Pakistani counterpart Yousuf Raza Gilani. The feud between the army and the government is taking place at a time when the economy is in tailspin and even Pakistan's key allies like Saudi Arabia and Qatar have refused to bail it out on the oil and gas front by extending the credit limit period. A wave of terrorism has engulfed the country even as the situation remains grim in the Af-Pak region. These are reasons which may compel the army to remain in barracks and not indulge in any misadventure like taking over the reins of the administration. The army is also still smarting from the operation carried out by US forces to kill Osama bin Laden at Abbottabad in May last year. It still needs time to restore its image as the saviour of Pakistan among the people. However, it is quite obvious to New Delhi that the growing uncertainty in Pakistan could also hit the bilateral dialogue process that was revived less than a year back after painstaking efforts by Prime Minister Manmohan Singh and his Pakistani counterpart Yousuf Raza Gilani. India's main worry is about the safety of Pakistan's nuclear assets. The fear of Pakistan's nuclear arsenal falling into wrong hands in the event of an escalation in the government-army conflict has come to haunt the Indian establishment again. Strategic experts, meanwhile, rule out the possibility of an army takeover in Pakistan at this juncture. Former National Security Adviser Brajesh Mishra said it was good that India had not uttered a word on the developments in Pakistan. He said it was an internal matter of Pakistan and "my advice to all Indians is to remain quiet." He also noted that none of the major world powers, including the US, had made a categorical comment on the happenings in Pakistan apart from making general statements. He also doubted if the army would be interested in takeover in Pakistan at this stage. Former Foreign Secretary Shashank said it would be very difficult for the Pakistan People's Party (PPP) and its coalition partners in the ruling dispensation to remain united after the recent developments. He said a military takeover was highly unlikely at this stage. He was of the view that the judiciary must not be emasculated in the ongoing feud between the civilian leadership and the army. ''What we are witnessing in Pakistan is the evolution of democracy though it is taking it's own time. Hopefully, it will survive,'' Shashank added. Former Indian High Commissioner to Pakistan G Parthasarthy said there was no need for the army to take over since it was confident that with the cooperation of Pakistan Chief Justice Iftikhar Muhammed Chaudhry, it could oust the government and force an early election. A Bench comprising Justices Dalveer Bhandari and Dipak Misra also gave a last opportunity for Punjab, Uttarakhand and West Bengal to file a status report on provision of such facilities. The Chief Secretaries of these states would be summoned to the court if they fail to file the necessary affidavits, it warned. The Bench, which is monitoring work in this connection, clarified that most states had, in their affidavits, sought financial assistance from the Centre for completing their project. It thus asked the states to approach the Human Resource Development Ministry with proper requests so that the Centre could help them implement the Supreme Court directive. In its order, the apex court emphasised the need for provision of toilet facility. Studies have shown that parents are reluctant to send their children, particularly girls, to schools which do not have toilets. The Bench also asked the Drinking Water and Sanitation Ministry to file an affidavit on the subject within three weeks. A Bench comprising Justices DK Jain and Anil R Dave delivered the verdict while dismissing a petition filed by employees of the Food Corporation of India, questioning a similar policy adopted by the FCI. 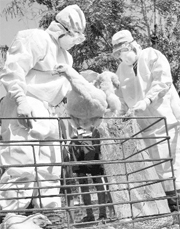 Way back in 1985, the FCI had announced two additional increments for employees on their acquiring professional degrees or diplomas after joining service. This incentive was not offered to those who joined service, already possessing such qualifications. One of the affected employees challenged this scheme in the Jammu and Kashmir High Court, contending that there could be no disparity in the pay scales of persons doing similar work. The HC allowed his plea and directed the FCI to grant him two additional increments. The FCI, however, refused to grant the benefit of the verdict to other similarly placed employees. Subsequently, the FCI and the Bhartiya Khadya Nigam Karamchari Sangh came to the SC. Instead of the CM’s official residence, the main event is scheduled to be held at the newly built ruling Bahujan Samaj Party (BSP) state party headquarters. On her last birthday, Mayawati had inaugurated and laid foundation stones of schemes and projects worth Rs 4,000 crore. The main function had been held at the imposing state-of-the-art 3,000-seater auditorium on the campus of the Dr Ram Manohar Lohia National Law College, the state’s biggest auditorium, which was also dedicated to the nation on that day. The much-touted UP Janhit Guarantee Ordinance ensuring time-bound delivery of public services to the ‘aam aadmi’ was also promulgated on her 55th birthday. Observing her 54th birthday (in 2010) as 'Public Welfare Day', CM Mayawati had pressed a button at her official 5, Kalidas residence to unmask 264 foundations stones marking the launch of welfare schemes to the tune of Rs 7,312 crore. It was on this day that she had launched the ambitious Uttar Pradesh Chief Minister Mahamaya Gharib Arthik Madad Yojana giving economic assistance of Rs 300 per month to poor persons not holding a BPL card or covered under any pension scheme of the state government (widow, old age, physically challenged). The 53rd birthday in 2009 was held in the shadow of the political turbulence following the murder of PWD engineer Manoj Gupta in Aurraiya district allegedly by BSP MLA Shekhar Tiwari after Gupta refused to help in raising money for the birthday celebration. Speaking at the function to mark her 53rd birthday, days after other political parties drew attention to the atrocities under the regime, she had profusely thanked Opposition parties for indulging in ‘natakbazi’ (drama) of all kinds which had given enough reason to her supporters to raise double the money even in times of general recession. Her 52nd birthday was the first one she held in her capacity as the CM during her fourth regime after assuming office with a full majority in May 2007. It was the grandest affair of all, marked by senior ministers and bureaucrats singing “Happy birthday to you” and competing to feed her a piece of the 5-kg cake. Before she cut the cake, CM Mayawati had given a piece of her mind to the media for tarnishing her image on such a joyous occasion by mentioning misuse of public money for the celebrations. On that day, she had generously opened the state’s coffers to formally inaugurate the Ganga Expressway, a Rs 40,000 crore infrastructure project connecting Noida with Ballia which is still stuck due to popular protest. In a letter to Chief Election Commissioner SY Quraishi, PETA chief functionary Poorva Joshipura has urged the CEC to request the state government to open the city’s memorials and parks and permit PETA to put banners decrying cruelty against animals on the jumbo statues. The international animal rights group has maintained that the exercise would help them encourage people worldwide to boycott circuses, thereby helping countless animals whose pain goes unnoticed. On January 7, the EC had ordered all statues of CM Mayawati and her party’s poll symbol - the elephant - to be draped by January 11. The order was complied with by covering these with plastic sheets or clothes. Despite subjecting itself to any law, the country has for centuries been hospitable to asylum seekers from its neighbourhood, be it Sri Lanka, Persia, Bangladesh or Tibet, Justice Katju said while addressing a conference on the role of Parliament and Judiciary in the protection of refugees, organised jointly by UNHCR and PIL Support and Research Centre (PILSARC) at the India International Centre (IIC) here. 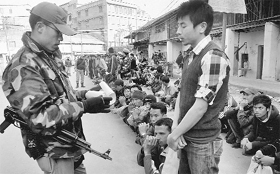 Countries like China, Japan and South Africa were refusing to grant asylum despite being signatories to the UN convention. This showed most countries merely gave sermons and were not interested in protecting the lives of those who approached them, fearing persecution and death at the hands of hostile regimes back home, he said. India should not allow itself to be dictated by any global power on the issue and should take its own time to sign the treaty or have a domestic law as it had the highest incidence of poverty, diseases, malnourishment, farmers’ suicide, unemployment and homelessness. "After more than 66 years of being considered unrecoverable by many, the remnants of an American aircraft, C-47B, which crashed during World War-II, were recovered by a team of 34th Battalion of the Assam Rifles last week in northern Tripura," an Army official told IANS. The remains of the aircraft were found at the remote tribal village of Birmani Para in Dhalai district in northern Tripura, 125 km north of state capital Agartala. The official said, "A series of search operations had been launched since September last year to find out the crash site in the thick and dense forests of all three hill ridges of northern Tripura — Baramura, Atharamura and Longtrai. Finally, our troopers achieved success last week." The Mumbai Police said they could not arrest him, as they were yet to receive the copy of the apex court order. "We can only take action if a order copy is marked to the police," DCP Pratap Dighavkar said. Pereira's lawyer Manjula Rao could not be reached for comment. On January 12, the Supreme Court upheld the three years jail term awarded to the Mumbai-based businessman for mowing down seven persons by his speeding car in an inebriated condition, but said the punishment for the "despicable aggravated offence" was "too meagre". The stamped broke out when a huge crowd gathered at Hussain Tekri's main entry to take part in Chehllum were pushed backward by the police to regulate their entry after midnight. "Six women and four men were killed in the incident," Additional Superintendent of Police (ASP) Rajesh Vyas said, adding they were crushed under the weight of many persons present at the spot. While bodies of 10 persons were found at one place, two others were traced slightly away from the place where the incident took place. However, the police suspects that they might have succumbed due to severe cold. Usually, persons suffering from mental illness visit the place with a belief that the visit to the sacred place will cure them of their problems. Ratlam Collector R K Sharma has ordered a magisterial probe into the incident and announced as ex-gratia of Rs 10,000 each to the victims. While the Congress is contesting from all seats, this will be the first time that Trinamool is entering the Assembly poll fray in a big way. The only Trinamool MLA, Sarat Singh, had made it to the House after winning the by-poll for Konthoujam seat in Imphal West district last year. Trinamool chief Mamata Banerjee would campaign in the state and her programme shall be finalised soon, party leader and observer in Manipur Sourav Choudhuri said. Election office sources said Manipur State Congress Party has fielded 38, NCP 23 and JD(U) 19 candidates. Prominent candidates in the fray are Chief Minister O Ibobi Singh, Forest Minister Th Debendra Singh, Food and Civil Supply Minister Y Erabot, Works Minister Ranjit Singh (all Congress), senior NCP leader and former chief minister Radhabinod Koijam, Manipur People's Party (MPP) president Nimaichand Luwang and senior MPP leader L Chandramani, election office sources said. All the governments ran in deficit and spent large fractions of their budgets over the past five years meeting the salaries and subsidies bill, leaving a small amount of money to be spent on social welfare. Punjab, in the past five years, spent the maximum money on the non-welfare segment, including salaries, pensions and subsidies. It also reported the fifth highest fiscal deficit - 3.6 per cent of its GDP - in the country. Among election-bound states, Punjab had a fiscal deficit of Rs 6,170 in 2009-10, next only to Uttar Pradesh which had the highest fiscal deficit of Rs 18,693 crore in 2009-10. National Election Watch (NEW), which conducted an analysis of financial indicators of states ahead of elections, found that salaries, pensions, interest payments and subsidies together make a significant portion of the revenue expenditure of all state governments. Punjab turned out at the top as 79 per cent of its revenue expenditure went in to pay salaries, interests and pensions. This expenditure is called committed expenditure in financial jargon. The percentage of revenue expenditure spent on salaries was 59 per cent in UP; 46 per cent in Goa; 45 per cent in Manipur and 55 per cent in Uttarakhand. In Punjab, the expenditure on salaries alone in 2009-10 was 43 per cent of the revenue expenditure, exceeding the norm of 35 per cent envisaged by the 12th Finance Commission. In UP, the salary bill in 2009-10 as a percentage of total revenue expenditure was 50 per cent, much more than the Finance Commission norm. Similar was the pension payment where the Commission’s norm is 66 pc, but the state witnessed a rise in pension payments by 177 per cent from Rs 3,991 crore in 2005-06 to Rs 11,007 crore in 2009-10. Uttar Pradesh spent hugely on subsidies - 38 per cent of its revenue expenditure went into energy subsidy; 28 per cent for rural development subsidy and 20 per cent for agriculture. Uttarakhand spent so much on salaries, pension and other components of committed expenditure that it was left with less than Rs 2,500 per person to spend on welfare schemes, the analysis found. Punjab earned another dubious distinction in the economic analysis of state budgets - it turned out to be the only state among the five poll-bound ones to report aggregate revenue deficit of Rs 13,580 crore from 2005 to 2010. All other states managed to shown revenue surplus during this period, but for Punjab which faced revenue deficit from 2007-08 as its revenue growth failed to surpass its revenue expenditure. The film has been instrumental in enlightening film buffs all over the world about Kokborok language and tribal traditions of the tiny state. The film has drawn accolades in many a reputed film festival within the country and abroad since 2008, the year it was made. “The film was produced by Sampari Pictures, a Church-backed organisation in 2008. It received Rajat Kamal in feature film category for 2008 in the year 2010. It was the opening film of Indian Panorama at IFFI 2008. The film received Bronze Drum in Nepal International Indigenous Film Festival and Special Jury Mention at the 7th Third Eye Asian Film Festival, Mumbai,” said the film’s director, Joseph Pulinthanath. He claimed that the film has so far been screened in 40 international film festivals abroad including MoMA, New India Festival at New York, 18th Brisbane International Film Festival and Moscow International Film Festival. “The film evokes curiosity among critics and film buffs as it is made in a lesser known tribal language, Kokborok, from Tripura. However, it is not the only film in Kokborok produced by Sampari Pictures. We have made few other features films in Kokborok starting with ‘Mathia’ (Bangle) in the year 2005,” the director said. The theme of ‘Yarwng’ revolves around the plight of the tribal population from Raima Valley who were displaced during construction of Dumbur (Gomati) Hydro-electricity Dam in South Tripura district. A large tract of fertile land was submerged because of the construction of the dam. The majority of the displaced population was that of Tripura, Reang and Molsom tribes. About eight lakh of the total of 10 lakh tribal people in Tripura speak Kokborok. The state has a total population of 37 lakh, dominated by Bengali-speaking Hindus, most of whom had roots in erstwhile East Pakistan (now Bangladesh). On paper, it is recognised as one of the two official language in Tripura, the other being Bengali. “Kokborok is the lingua franca for tribals in Tripura. As the language doesn’t have its own script, some follow Roman script while some prefer Bengali script. However, Roman script is more suitable when it comes to expressing in Kokborok,” said Khumtiya Debbarma, a teacher in the Centre for Tribal Language Study in Tripura University. Movement for Kokborok headed by Amulya Ratan Jamatia is fighting for adoption of Roman script for the tribal language while the senior generation of tribals prefers Bengali script as does the ruling Left Front. The Cabinet Committee on Infrastructure (CCI) which met here cleared the widening of Kiratpur-Ner Chowk section at a cost of Rs 2,356.2 crore, six-laning of Vijaywada-Gundugolanu section in Andhra Pradesh worth Rs 2,011 crore and Rs 1,021.16 crore scheme for the four-laning of the highway on the UP/Haryana border. The widening of 84.38 km stretch on the Kiratpur-Ner Chowk section on national highway (NH) 21 will be implemented under National Highway Development Project (NHDP) phase III on design, build, finance, operate and transfer (DBFOT) basis in BOT toll mode of delivery. Of the entire cost, Rs 537.37 crore will be spent on land acquisition, rehabilitation etc, the government said in a statement. NH-21 is not only an important link connecting the National Capital and tourist destination of Manali in Himachal Pradesh, but is also a major link to Leh in Ladakh. The project will wind its way through the districts of Rupnagar, Bilaspur and Manali in Himachal Pradesh. Out of the total cost of the 104.7-km Haryana project on NH-73 - on Uttar Pradesh/Haryana border passing through Yamunanagar - Saha - Bawala - Panchkula - under NHDP Phase-III on DBFOT basis in BOT (toll) mode, Rs 86.23 crore will be for land acquisition, rehabilitation, resettlement and pre-construction. About the Andhra Pradesh project covering 103.59 km, the statement said it would be implemented under NHDP Phase V on DBFOT basis in BOT (toll) mode of delivery. "The total estimated project cost will be Rs 2,011 crore out of which Rs 327 crore will be for the land acquisition, rehabilitation, resettlement and pre-construction," it said. NH-5 is an important link connecting Kolkata to Chennai, which is part of the Golden Quadrilateral (GQ) Corridor. At stake is the governance of India's financial capital which enjoys a budget of Rs 21,000 crore and provides a number of services ranging from the routine road management and water supply to health care, electricity distribution and transportation services. The city rakes in more than Rs 10,000 crore every year by way of octroi and property taxes alone. 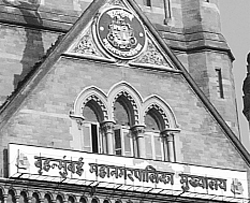 Standing committees in the BMC comprising elected representatives decide how the civic budget is allocated, thus allowing them powers that exceed those of MLAs of several small states in the country. "The Congress makes money because it controls the BMC and the Shiv Sena will also do so after it comes to power," Sena supremo Bal Thackeray had said more than two decades ago at the launch of the party mouthpiece Saamna. The Sena went on to do just that in the years that followed, say Congressmen. "The Shiv Sena-BJP indulged in massive corruption in awarding of contracts for road repair and infrastructure projects," says Nitesh Rane, party leader and son of Maharashtra minister Narayan Rane. Nitesh, who heads an NGO called Swabhimaan Sanghatana to mobilise support for the Congress at the grassroots, is one of the many campaigners who are raking up issues pertaining to corrupt ways of the Shiv Sena-BJP combine for the past two decades. On the other hand, the Shiv Sena and the BJP have both been forced to be on the defensive. They are defending their track record in governing the city. "We have shown how to initiate development," says Shiv Sena leader Uddhav Thackeray, in posters and banners across Mumbai. The party is citing construction of flyovers across the city and improvement in road transport over the past two decades as its major achievement. However, the contest for the 227-seat corporation will see a joker in the pack. The Maharashtra Navnirman Sena, which is playing the Marathi chauvinist card, is a major factor in the BMC elections. In the last Lok Sabha and Assembly elections, the MNS ate into the votes of the Shiv Sena-BJP combine. In the BMC elections, BJP leaders fear that the MNS would damage them even more than the Shiv Sena. "In areas where the BJP fields its candidates, the Marathi voters tend to vote for the MNS, thereby hurting us," says a BJP leader at Dahisar in North Mumbai, where the MNS has made inroads over the past few years. Under Raj Thackeray, the MNS is proceeding systematically in selecting its candidates. Aspirants for tickets in all the 227 seats have been asked to appear for written examinations and interviews are being conducted to eliminate weaker hands from the fray. The party has even hired a market research agency which indicated that the MNS could win in 50 seats, thus allowing them to play kingmakers after the elections. The party has a strong chance in 20 more seats according to the survey, say party sources. Sections of the BJP are even pushing for a three-way alliance with the Shiv Sena and the MNS after the elections in order to hold on to power. For the Shiv Sena, the BMC elections will determine its financial future. The party's corporators have funded the Shiv Sena candidates in both the Lok Sabha and Assembly elections and their services would be required for the 2014 Lok Sabha elections, say observers. On the other hand, a victory at the Mumbai civic polls for the Congress would ensure that the Opposition parties are left financially crippled during the next outing at the hustings. At stake are a number of big-ticket projects that promise immense fortune. Development of the sprawling Dharavi slum is all set to be cleared in the next few months. Also on the anvil is increase in the floor space index, which would allow for taller buildings in Mumbai. The top officers of the Irrigation Department of both the states were present in the meeting chaired by Secretary, MOWR, Dhruv Narain Singh. The Chairman of Central Water Commission and Members of Ganga Flood Control Commission and Planning Commission were also present in the meeting besides senior officers of the Union agriculture and finance ministries. The Uttar Pradesh Government had raised a hue and cry for the release of water in the canal that caters to the irrigation needs of its farmers in four districts in the eastern part of the state. Bihar’s plea was that the Gandak Canal, which originates in Nepal and caters to irrigation facilities in Bihar and Uttar Pradesh, besides a small portion (19 km) across the border, had been shut on November 15, 2011, for renovation and repairs with the permission of the Centre that had provided the requisite funds. The Bihar Government is responsible for getting the work executed according to the bilateral agreement between India and Nepal. The information about the canal’s closure was conveyed to all concerned in the Uttar Pradesh Government. The closure of the canal had deprived the farmers of Bihar and Nepal in addition to Uttar Pradesh. Apparently, the poll-bound Uttar Pradesh was not willing to annoy its farmers (read voters). First, they sent an SOS to Bihar for the immediate release of water at the level of Principal Secretary of the Irrigation Department. Then, the Chief Secretary of UP came down to Patna with a team of his officers and held a meeting with his Bihar counterpart to sort out the issue. But Bihar conveyed its helplessness in getting the consent of the Centre that had been spending the money on repairs. The five sub-inspectors and one assistant sub inspector were issued their dismissal letters today. Following grant of bail, they all came out of jail and resumed duty, pending the outcome of departmental proceedings against them. After officers supposed to conduct the departmental proceedings against the cops did not complete the task, Director General of Police Abhayanand organised a special camp on the Vigilance Office premises for speedy disposal of proceedings against police officers in November. The officers probing charges against these cops found them to be true and recommended their dismissal from service. ADG (Hqs) Ravindra Kumar said similar action against other police officers facing graft charges was in the pipeline. Five members of the family were sleeping when the robbers broke into their farmhouse, attacked the family and looted their belongings. The victims were Ratna Ram, his wife Dakhu Devi and their 14-year-old grand-daughter Sangeeta, police said. Ram's daughter-in-law Dariyav and her mother Dhagali Devi were seriously injured, they said. The assailants came on a motorcycle and ran away with the family car, leaving behind their bike, police said.